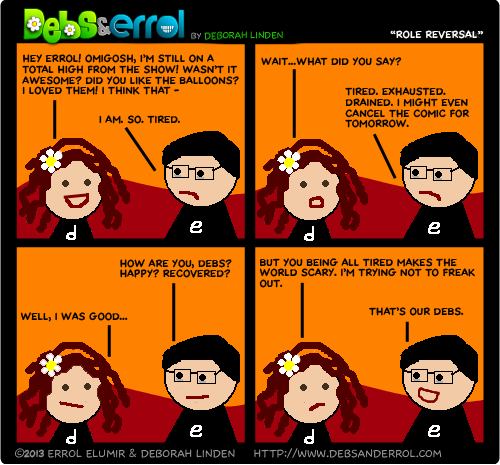 Debs: I went out of town right after the concert so I didn’t really get to talk to Errol much about how it went. I came back and this conversation happened. Poor Errol. He said he’d do the comic even after I offered to but I’m pretty sure he fell asleep at his desk. Next time, there will be moar eyebags! Now I’m picturing a bag full of eyes. Tomorrow, we hope to record a cover with Kari! That’s SO MEAN! 😀 Bwahaha, nice, MP. Just to clarify: by “tomorrow,” you mean “today,” right? I think we may be doing the recording during a weather-based apocalypse. This is the first “winter storm warning” I have ever seen in mid-April. You guys aren’t the only ones that winter is overrunning for- the trees over here are barely beginning to come into leaf, and we’re supposed to get milder weather than Canada. Today 😀 I’m still not used to this whole “post the night before” thing. I guess that means you’re not riding your bike, eh? I think it would be just a slightly bad idea for me to attempt to ride my bike in an ice storm. I’ll stick to the subway and walking for now. Cool comic, Debs! I hope someone tossed a blanket over Errol… or pulled Jiggly puff at least. I want to hear what you guys record with Kari! You are awesome, she is awesome. None of those things happened to Errol… Obviously he fell foul of the more common anime method of inducing extended periods of sleep, somebody with a massive hammer. You know…he never told me why he disappeared. Huzzah! The recording was successful! I noticed you guys talking about weather up there… mid april here is meant to be mid autumn but nooooo, summer is lasting way too long! it’s still warm enough to swim in the sea. I’m dying of the heat here in Florida. 8am and it’s currently already 75 degrees F. The storms we had last night did nothing.. ugh.